In Man’s Inhumanity: 14 Pacified Implements German artist Günther Uecker presented a personal response to life and suffering. Born in Mecklenburg, in the eastern German Democratic Republic in 1930, Uecker moved to the west in 1953 to study in Düsseldorf. His experience–spanning some of the most traumatic events in recent history and the social and political values of the East, the West and of unification–informs his practice. His forms are not premeditated nor planned, evolving instead out of an intuitive process of thinking and acting. A close physical relationship between the artist and his materials is signalled in the scale and construction of the works. 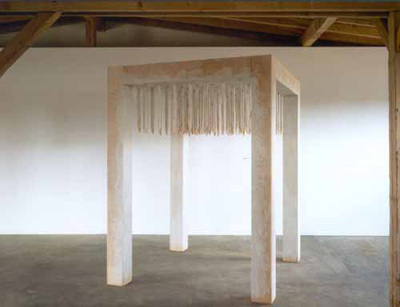 Self-consciously non-academic in approach, Uecker’s art nevertheless invites comparison with minimalism, arte povera and constructivism. The works were intended to be intrusive–to confront us and to challenge our attitudes to histories of violence, aggression and intolerance. Organised by the Institute of Foreign Relations (IfA) Stuttgart with the Goethe-Institut Inter Nationes, Wellington.